Above: Full Body Burial at Sea Slideshow on the East Coast through New England Burials. ﻿Sometimes called whole body burial at sea. ​Full Body Burial at Sea is a time-honored tradition in maritime operations where a deceased is buried in the ocean, body intact. Methods for performing these burials have varied across the centuries. You may have seen depictions in movies such as Master and Commander, where they wrap the deceased in canvas and tie it closed, using cannon balls as weights. In the funeral industry in modern times, full body burials at sea have become much more encumbered, using a metal casket which has to be drilled with holes, and wrapped with chains. This has proved to be cost prohibitive and not practical for families. These caskets are very difficult to get on the boat, and an on-board crane is needed to off-load the casket. 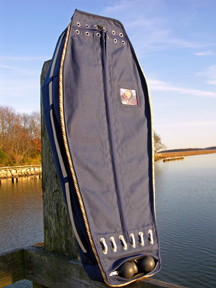 Ashes on the Sea has partnered with New England Burials at Sea to bring you a full body option using a practical, elegant canvas shroud. ﻿What boats do you use?